Arctic Cat has added a second model to its consumer race replica family at the recent Hay Days event in Minnesota – the 2014 ZR 6000 Sno Pro RR. You can read about the 2014 ZR 8000 RR, Cat’s other race replica, here. 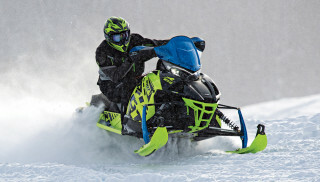 Powering the ZR 6000 Sno Pro RR is Arctic Cat’s own C-TEC2 599cc two-stroke engine, which we first saw in the ZR 6000 El Tigre. According to Arctic Cat, the C-TEC2 boasts an array of component specs proven during two seasons of championship-winning success in snocross and cross-country racing. This race-replica shares many of the same features enjoyed by Team Arctic racers, including competition-spec components like FOX FLOAT EVOL X ski shocks; the complete RMC race brake system; lightweight disc and race pads; and running board edge-rolls and reinforcements. The ZR 6000 Sno Pro RR also comes with the race-version of the FastTrack SLIDEACTION rear suspension, complete with FOX Zero-X shocks featuring remote reservoirs and clicker adjustments. The platform for the sled’s race-bred performance is the ProCross chassis and tapered two-piece tunnel. 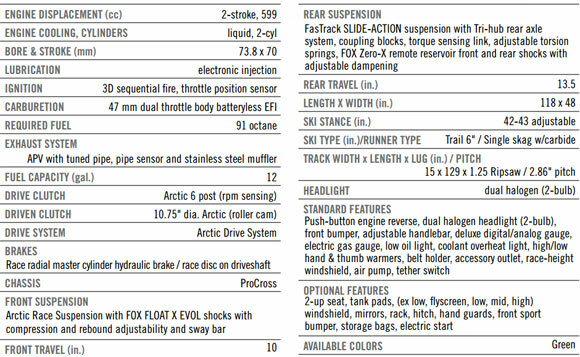 The front Arctic Race Suspension features lightened spindles. Boasting 10 inches of travel up front and 13.5 inches at the rear – with all shocks calibrated to the same specifications as the cross-country Sno Pro race sled – the RR is built to blast bumps and handle even the most aggressive riders. Powering the RR is the all-new C-TEC2 599cc laydown engine designed and built by Arctic Cat for the 125-hp class. The engine features the new Dual-Stage Injection system and electric oil injection that’s matched by the latest iterations of batteryless EFI, APV electronic exhaust valves and the exhaust pipe temperature sensor. Its push-button engine reverse adds convenience with no compromise of added weight.